"MLS" redirects here. For other uses, see MLS (disambiguation). Major League Soccer (MLS) is a men's professional soccer league sanctioned by the United States Soccer Federation which represents the sport's highest level in the United States. The league comprises 24 teams—21 in the U.S. and 3 in Canada and constitutes one of the major professional sports leagues in both countries. The regular season runs from March to October, with each team playing 34 games; the team with the best record is awarded the Supporters' Shield. Fourteen teams compete in the postseason MLS Cup Playoffs through October and November, culminating in the championship game, the MLS Cup. MLS teams also play in domestic competitions against teams from other divisions in the U.S. Open Cup and in the Canadian Championship. MLS teams also compete against continental rivals in the CONCACAF Champions League. The league plans to expand to 27 teams with the addition of Inter Miami CF and Nashville SC in 2020 and Austin FC in 2021, with further plans to expand to 28 teams by 2022 and 30 teams at a later date. With an average attendance of over 20,000 per game, MLS has the third highest average attendance of any sports league in the U.S. after the National Football League (NFL) and Major League Baseball (MLB), and is the seventh highest attended professional soccer league worldwide. 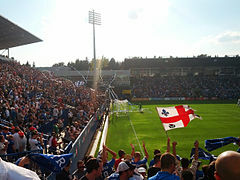 MLS has regularly expanded since the 2005 season. The league plans to expand to 27 teams with the addition of Inter Miami CF and Nashville SC in 2020 and Austin FC in 2021, with further plans to expand to 28 teams by 2022 and 30 teams at a later date. MLS announced on December 20, 2017, that it would be awarding an expansion franchise to Nashville, who would play in a yet-to-be-built soccer-specific stadium, Nashville Fairgrounds Stadium, and are expected to join MLS in 2019 or 2020. 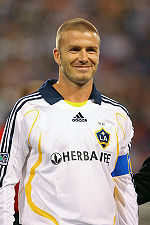 On January 29, 2018, MLS awarded Miami an expansion team, led by David Beckham. Inter Miami CF will start play in the 2020 season and open a proposed 25,000-seat stadium soon after. An expansion team was awarded to Cincinnati, Ohio on May 29, 2018, to the ownership group of USL's FC Cincinnati. The team, which will retain the existing FC Cincinnati name, will start MLS play in 2019 and move to a new stadium in 2021 with a minimum capacity of 25,000 seats. In 2013, New York City FC agreed to pay a record $100 million expansion fee for the right to join MLS in 2015. This record was surpassed by the ownership groups of FC Cincinnati and a new Nashville team, which each paid $150 million to join MLS (FC Cincinnati in 2019 and Nashville in 2020). 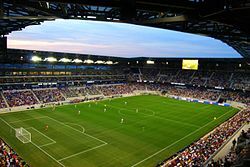 [a] The same amount was paid as an effective entrance fee by a group that bought Columbus Crew SC in 2018, which led to that team's previous operator receiving a new team in Austin, Texas that will likely join MLS in 2021. Wikimedia Commons has media related to Major League Soccer.